Ecosystem fish and Koi ponds are truly the crown jewel of the water feature world. They instantly become the centerpiece of your landscape. These low-maintenance, natural-looking water gardens work with nature's own processes to stay clean, clear and healthy without using chemicals. They are completely organic and perfectly safe for your pets and families as well as the surrounding wildlife. The key is the symbiotic relationship between the pond fish, the aquatic plants, and the organic pond filtration system that make up the ecosystem. This is an example of our introductory-level 8x10' pond. It comes complete with a skimmer, a biofilter hidden in the waterfall, a pump and all necessary plumbing, and several tons of small and medium sized hand-placed Moss Rock boulders. 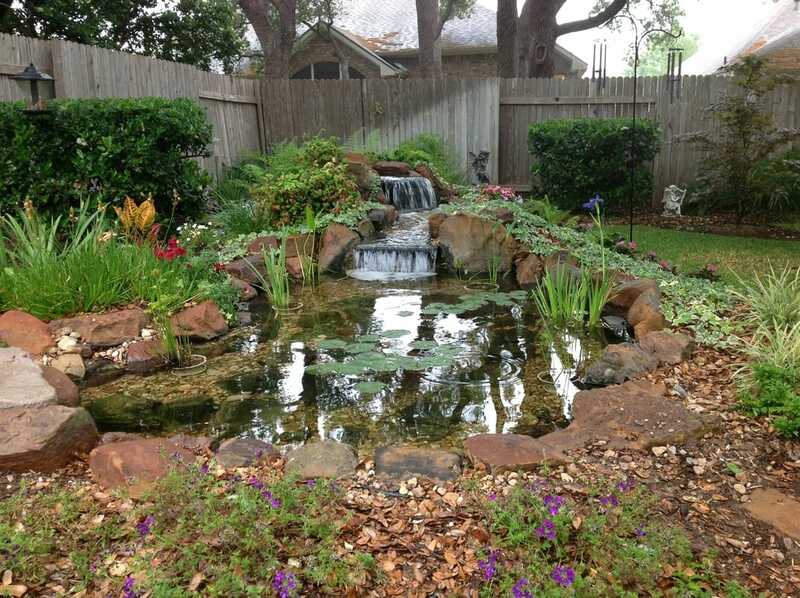 This 10x12' pond with an 8-foot stream and waterfall represents the next level in backyard ponds. There is a larger biofilter, skimmer, and pump in this system so you can have more fish. 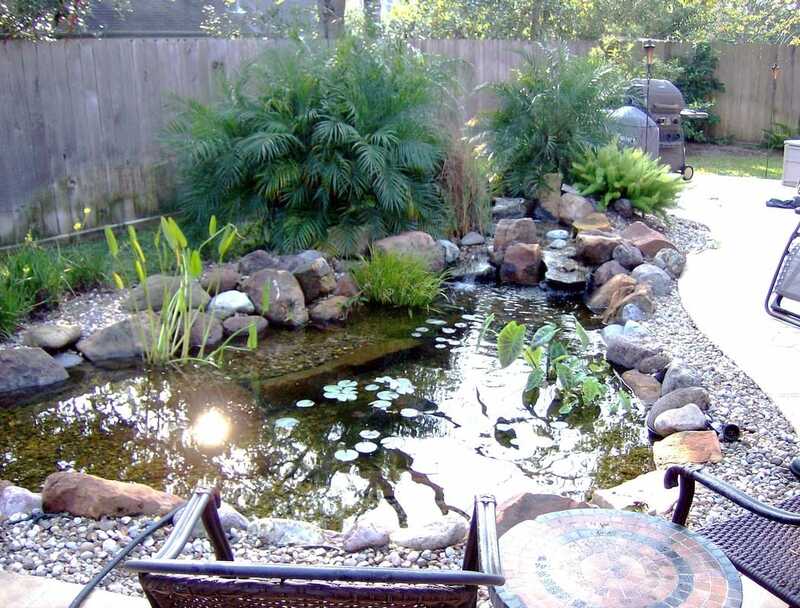 Larger character boulders give the pond a sturdier look and feel. 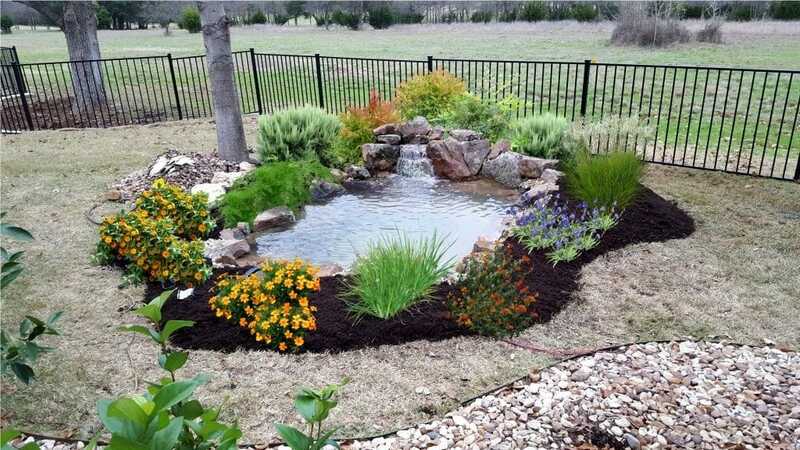 The addition of a stream adds to the overall feature without adding as much cost as increasing the pond size. A fairly standard size for an average backyard pond is around 10x15'. 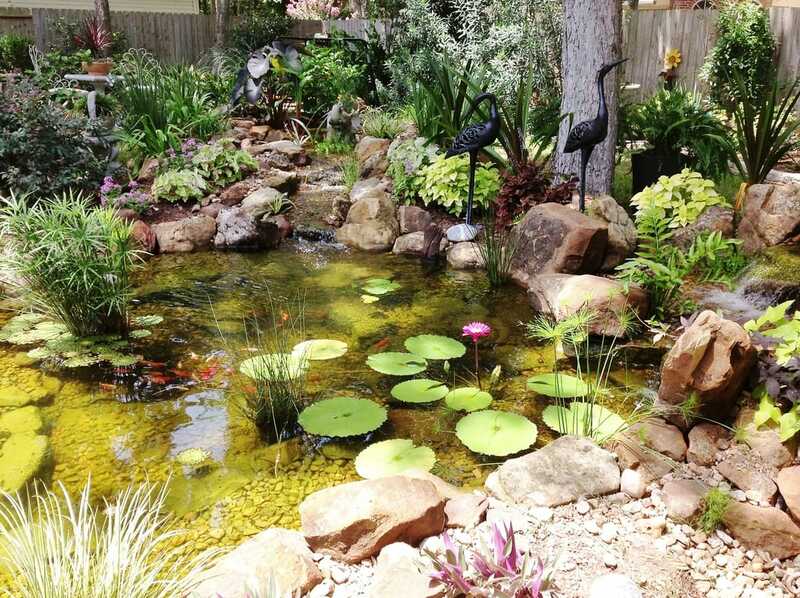 This size pond includes an even larger biofilter, skimmer, and pump to filter more water so you can have even more fish! There are more large boulders to give the pond a character that can't be achieved using only small, hand-placed stones. Once we get to ponds around 15x15', we either employ multiple biofilters or a constructed wetlands, or 'bog' filter. This 15x15' pond features both a waterfall and a bog filter which creates a second waterfall as it returns clean water to the pond. This filter works by forcing the water through layers of gravel and the roots of aquatic plants that are planted in the bog. 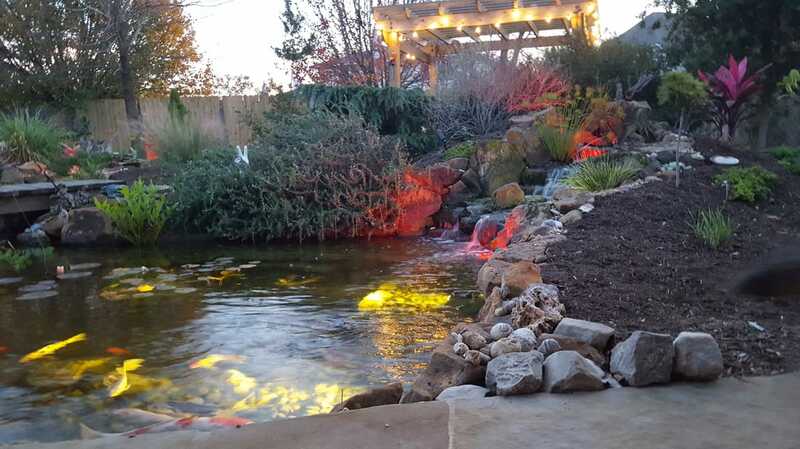 This 15x20' ecosystem pond features two biofilters and pumps that are used to create many different waterfall cascades. It provides a stunning view through the back windows of the house. It has large machine-set boulders both in and outside the pond to help blend the look together. There is a fish tunnel so the Koi can swim in one end and appear at the other side of the pond! When you have the appetite and budget for one of our large ponds, this is when the real magic happens. You can have multiple waterfalls, streams, fish tunnels or even color-changing LED lights. 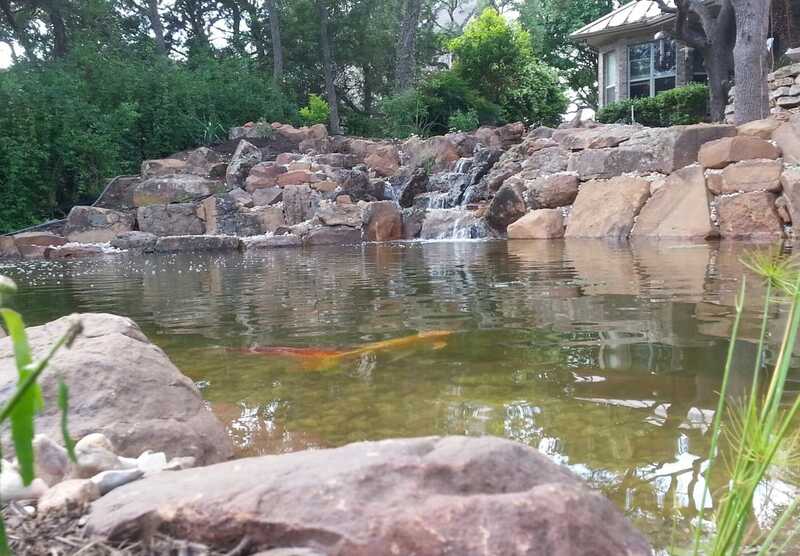 We can bring the pond right up to your patio so that the fish can eat right out of your hand! The possibilities are almost endless. If you can dream it, we can probably create it for you. 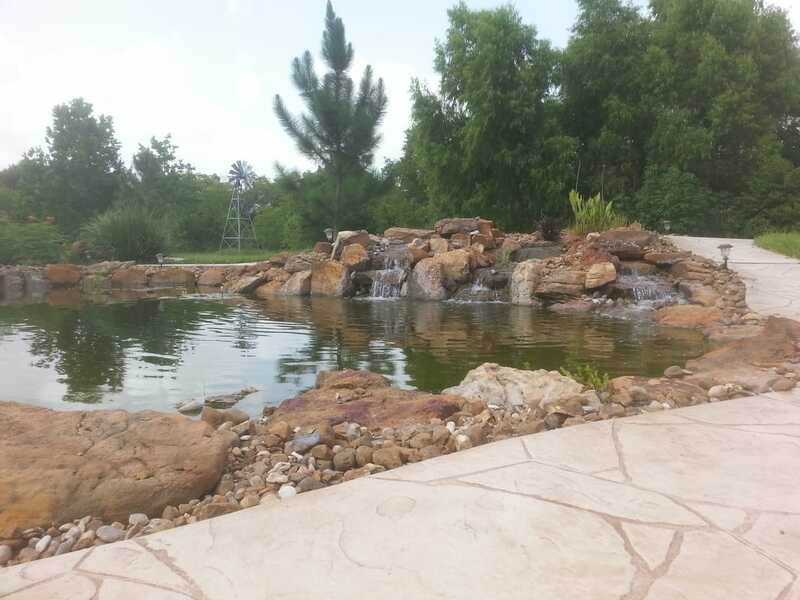 Every large pond is a custom designed creation. Prices in this section are for reference only. The centerpiece of this suburban backyard setting is the 20x20' pond. It's like being in a vacation resort every day when you come home! The bog filter sends clean water through the stream which has multiple drops for more motion and sound. The waterfall on the right is the focal point, featuring multiple cascades at differing angles for more viewing interest. Large, machine-set boulders give it the character that a pond this size requires. Optional soft-white and color-changing LED lighting makes for magical nighttime experiences. On a large lot, only a large pond will look proportional. This one is 20x30' and unlike most backyard ponds that we build, it's not two feet deep. It's FIVE feet deep! It also has a constructed wetlands filtering the water and two large pumps feeding the three waterfalls. It also has jets at the lowest level to make sure that the water in the pond stays well-circulated and aerated. A backyard pond of epic propertions, this one is 30x35' and FIVE FEET DEEP! It takes two skimmers and two pumps to power this monster pond. Upstream from the massive waterfall is a smaller waterfall, leading into a wetlands filter. This feeds clean water into a fifty-foot long stream. It all comes together in one impressive waterfall that leads to the ecosystem pond. In a pond like this, almost every boulder must be set with machines, so it's slow going. But the end result is truly worth the wait. Truly, this is the pond builder's art!